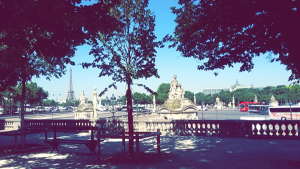 July 15 was our final day as a group in Paris. It began with a street art tour. Street art may be something that we obliviously walk by every day, especially in Paris, which in many ways can be said to be the world’s largest open-air-museum. But otherwise, street art in the traditional sense, and for the most part, is ignored, is considered illegal, and is generated with the knowledge that it is ephemeral, that it will fade away, may suffer vandalism, or get altogether dismantled and removed by the authorities. One wonders, then, what is the point of street art, specially knowing that it is by its very definition transitory, “fugitive,” illicit, and fragile. Another question is whether or not street art is indeed art: Who decides that it is really art? What is art? Why is street art illegal, what would be on a wall or a structure had the art not been there, and would the viewer be better or worse off without it? Is street art really worse than a blank dirty wall? Our street art tour got us thinking about this public form of artistic expression in ways that we might not have considered before. It made us take heed of, and focus more attention on, things that we might have passed by, or overlooked, or disdained beforehand. Long before humans were able to write and read, they were in fact, perhaps unwittingly, making art. Indeed, there seems to be an innate human need to leave a mark on this earth, and in this case “street art” appears to be the medium of choice for leaving one’s imprints on the world about us. In fact, so important is it for “street artists” to leave their mark, that they are often willing to go to great heights and lengths, reaching for odd impracticable places, often at great personal risks to their safety, just to be able to showcase their creations. In a way, “street artists” are immortal in the sense that when someone covers up their creation, they often return to it, and coat the “canvas” with another illustration; or other artists may come to it and add their own input. In fact, more street art is always being put up than can ever be taken down. 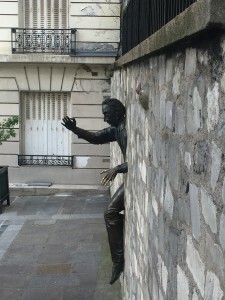 This very public and free art form allows people to express themselves, displaying their politics, their challenges, their life difficulties, societal issues, the inhumanity (andhumanity) of humans, and hopes, dreams and fears, and perhaps even just the need to convey something that is simply and randomly beautiful and ought to be shared. At times images can speak louder than words, without forcing one’s views on the audience, and due to the fact that art can be interpreted differently by different people. There is no wrong way or right way of artistic creation. Some may look at a piece of wall art and say “I could frame that and put it in my home”; others may cringe in horror. And so, street art is definitely a form that that doesn’t please everyone and does not move everyone in the same manner. But that is not the point. We may not know the meaning or understand the purpose of a given display; yet someone felt the need and had a desire to put it on the wall. Take for instance the impulse (or art) of glueing cards to a ceiling; or making a plaster model of a breast, painting it, and glueing it to a wall. These sorts of displays awaken a certain curiosity in the viewer, making them wonder whatever drove the author to express themselves in such a manner. To wit, the breast could be a woman’s statement on misogyny, or patriarchy, or simply a way of expressing her freedom. Other displays may pay homage to a dead artist, victims of a terrorist attack, a movie, or even traditional artists or classical paintings. Street art may convey strong, perhaps troubling images; an African baby sitting in a Louis Vuitton bucket for instance. What is the meaning of such an image? A viewer, depending on his or her predisposition and socialization may look at such an image from different perspectives: What does an African baby sitting in a Louis Vuitton bucket mean? 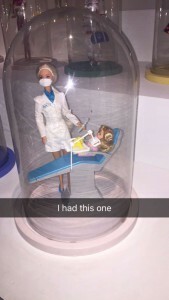 Some may put more value on (and bring more attention to) the baby. Others may valorize the bucket instead; a Louis Vuitton, of course. Such an image may also make us wonder where exactly our charity money go; does what we donate go to help an African baby, or does it become someone’s undeserved, decadent, luxury item? 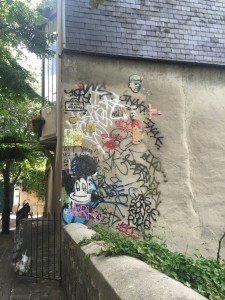 Much of the street art may be on or around “ugly buildings” that were hastily erected during the housing crisis in France after World War II and the Algerian war. The artists “tagging” these structures may be trying to make them beautiful for themselves and their neighbors. If we can’t tell what it is at least it adds color and character to the wall. Artists make use of many different methods, such as spray paint, stencils, gluing on a sculpture, wood, tiles, chalk etc. Art may also be made out of biodegradable or recycled material such a grass, plants, broken glass, mirrors, paper etc., although it should be noted that these street art neighborhoods are not for every neighborhood in Paris. 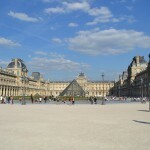 Yet, it may be nice to have a variety of looks and different perspectives of the city of Paris. 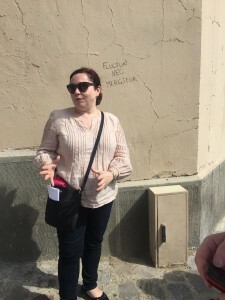 During our tour an old man noticed us studying the street art, and he excitedly came over to us to let us know where to find more and which ones we absolutely had to see. His eyes lit up, he was proud of the street art in his neighborhood, and he wanted it to be seen and shared. Later in the evening we went out and enjoyed our final dinner together; a gathering à la française filled with great food and talk and laughter. We discussed our favorite and least favorite parts of our program. We all found it difficult to pick a “least favorite” besides wishing the course had lasted longer. This final day and final dinner together was bittersweet. After dinner we headed off to our bateaux mouches tour for a final ride along the seine, just before the sun was about to set. On board, we had a perfect view of the city’s monuments, with a beautifully colored sunset in the background. As night began caressing the buildings, they were lit up (albeit discretely and elegantly) with artificial light, emphasizing their breathtaking architecture. The best time to be out in Paris is by night. The Tour Eiffel was lit up as well, in the colors of the French flag, blue white and red; a beautiful sight and a powerful image, especially on the week of Bastille Day and in light of the horrors visited on Paris, most recently the carnage and terrible loss of life in the Nice attack. 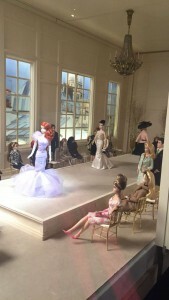 A bit of unease notwithstanding, it was a beautiful way to end the night and to end the program. 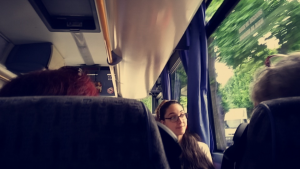 We will all miss each other and the good times we had together in Paris, but we know that we will all meet again, (qui sait?) perhaps in Paris as well. “We’ll always have Paris” as they say. Hello again from the other side of the pond! It’s France’s national holiday today!! 🙂 It was a bit more of a relaxing day for us. We were able to sleep in and had the morning off to do any last minute souvenir shopping or just relax. At 1:30 we had a scheduled movie day and were able to discuss them. 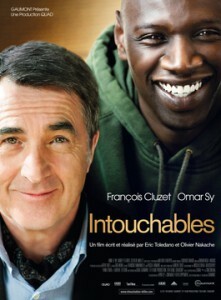 We watched Intouchables which is based on a true story about an unlikely friendship that formed between a wealthy quadriplegic and his new caretaker who was recently released from prison. The movie was amazing and I highly recommend it! What was more interesting was that this movie brought people from completely different social classes together once it came to theaters. This movie, as you can imagine, is moving and speaks volumes. 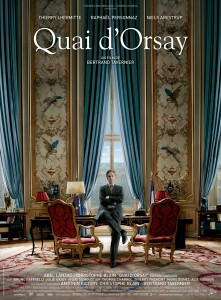 The other movie we watched was Quai D’Orsay (The French Minister) which told the story of a new speechwriter that has to learn to maneuver his way through the internal politics, while trying to create a specific speech for the french minister of foreign affairs. This movie was interesting because it showed a different side of politics, particularly what goes on inside the walls on a daily basis. It is a political movie, but was lightened up with some great humor. We only have one more day left and the time spent here has been amazing! I have made some great friends that I plan on having for a long time to come!! The professors have been awesome and so knowledgeable that I would recommend this trip to anyone! Everywhere that we have been to has been an amazing place. From the famous monuments to the museums to the people and even our own group, this trip has been the best decision I could have ever made!! Today, we took a walking tour of Montmartre. This neighborhood is located on a hill, where you can see a beautiful view of Paris! This city is filled with art, history, and a few beautiful churches. The movie Amélie was filled here in Montmartre. We were able to eat in the very cafe where she works. Also, the famous Dalida lived here! Additionally, many famous and not so famous artists lived in Montmartre because it was a cheap place to live. Legend says, if you touch his hand you’ll get good luck. 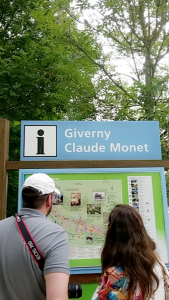 Today was really great time spent at o Giverny, Monet’s house and gardens: Claude Monet and Impressionism. I can’t begin to tell you how beautiful this place was full of life, nature, flowers, and his amazing work of art displayed inside his house; not to mention the beautiful refurbished inside of his house which gives you a perfect idea of how he used to live with his family, and the amazing feeling of just being there fills you with ideas of a great life style way of living. Our visit actually started with a nice lunch amongst each other at a café, which was ok maybe a little over priced compared to the other lunch spots we’ve been to. 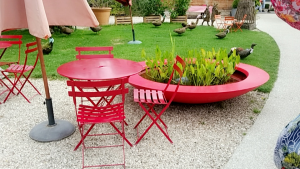 However, it was a really nice comfortable place to go, and enjoy the nice breeze around artistic decoration like ducks, rabbits, and others. It really made it feel comfy. Following our lunch brake, we were scheduled for a 2:00pm tour of the beautiful estate. 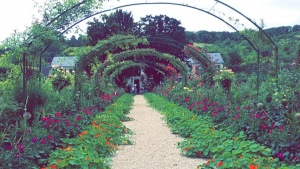 Claude Monet’s Foundation presents the beautiful gardens and the house of Claude Monet in Giverny. It was really amazing, and breath taking walking through this beautiful garden. One of the most beautiful places I would say I have been to. 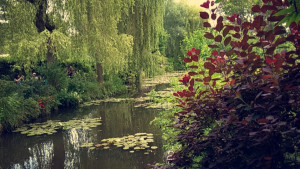 It really is nice to see how well preserved everything is, and learning how Monet would always want to keep his garden in perfect condition, and having 6 people helping him making sure everything stayed perfect. As you can see in this picture is the beautiful entrance leading up to his house, which gives the appearance of walking into a palace. as you walk up you can enjoy the beautiful flowers of his gardens. 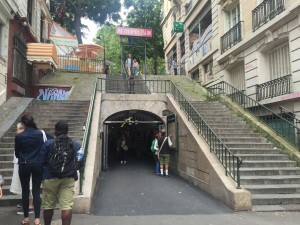 Literally, one metro stop from our dorms (“le Cité Universitaire”) lies the dark side of Paris – known simply as Les Catacombes. 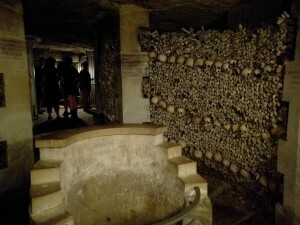 While not exactly catacombs in the truest sense of the word (it’s actually an ossuary), that doesn’t mean it’s any less interesting. 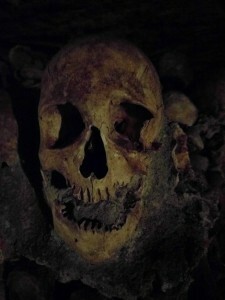 Les Catacombes began as limestone quarries outside the city of Paris. As Paris continued to grow, so did the quarries and much of this space eventually created instability to the structures above. 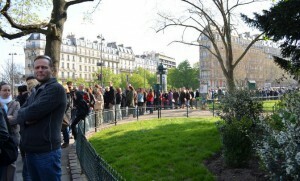 Originally the area was named “Place D’Enfer (Hell’s Gate) until the French Revolution in 1789. This name comes from the common sight of smoke rising from the ground entries, from the seedy individuals who called it home. 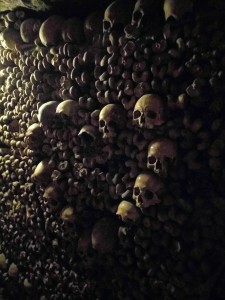 (Likely from the fires they burned below ground to keep warm, etc.–temperature in Les Catacombes is a steady 57ºF). Today, however, the area is called Denfert-Rouchereau. 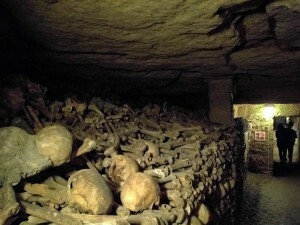 By the 18th century, Paris was experiencing yet another problem: it had no place to bury its dead. As the city grew, its outlying areas (where many of the cemeteries were located) were now part of the city and the cemeteries were causing problems for the residents and shopkeepers. Water and soil were contaminated, posing health risks to residents. (Side note: The tour guide mentioned that wine and milk would spoil within hours and perfume was unable to be sold due to the stench in the air). Over- burying in cemeteries also created instability to the area (due to expanse of abandoned quarries underneath) and in 1780, the situation was so dire that a solution was required. 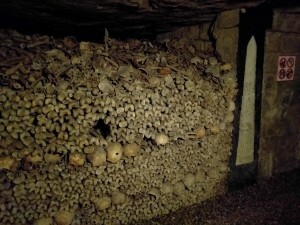 That solution: les Catacombes. 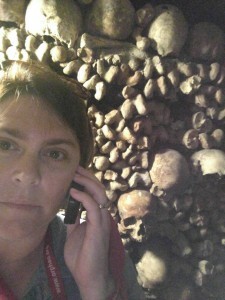 So, in essence, Les Catacombes provided a solution to settle these two distinct problems. And, what a clever idea it was. It actually took over 12 years to move the bodies from the cemeteries (work was only done at night so as to not scare/disturb residents). Once you arrive at les Catacombes, you must descend 130 steps down a spiral staircase (yes, it did make me a little dizzy, actually!) 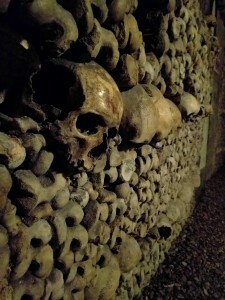 and you realize that it is almost like an underground city, with “avenues” and arches, columns and art…but instead of using bricks and mortar, these walls are made with skulls and leg bones. It is absolutely fascinating to see just how far and wide these tunnels of bones go (and to realize that every two leg bones belong to one person…it’s easy to see why there is an estimated 6.7 million skeletons placed down there). It may be interesting to know that much care has been taken to denote which cemeteries the bones came from and when brought to the location (despite the fact that there are no indications of who the bones belonged to in the first place). Much care, too, has been taken in creating “wall” that is not only efficient but even created with purpose (there are many arrangements created by the skulls and bones into patterns like hearts, crosses, etc.). 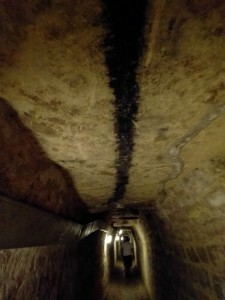 The black line on the ceiling was to direct tourists through les Catacombes (before electricity). Getting a lot of great information from the audio guide. Patterns created from the bones can be seen along many of the walls, like this heart shape created out of skulls. 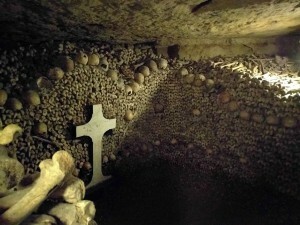 Les Catacombes are believed to house the bones of approximately 6.7 million people. The depth of the stacked bones…. 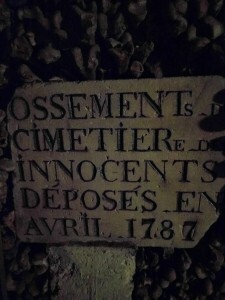 One of the first cemeteries (Les Innocents) where the bones were removed and transferred to Les Catacombes. All in all, it was extremely interesting (I would highly advise the audio guide as well). Bon weekend, tout le monde (everyone)! After one full fulfilling week of walks, visits, discussions, and history lessons in Paris we were granted a well-earned restorative “grasse matinée” this Friday morning July 8, 2016; just enough time to digest and reflect on the week’s happenings before venturing out into the city again. We began our day by visiting Boulevard Haussmann, which, compared to the smaller narrower quaint old Parisian streets that most people may be familiar with, is one grand, spacious tree-lined avenue consisting mainly of apartment blocks, but famous also for its iconic Parisian department stores, namely the famous Galeries Lafayette, and Printemps. 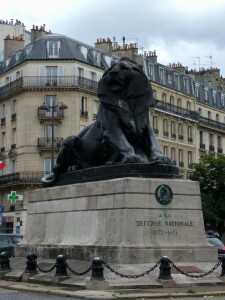 Boulevard Haussmann was named after the architect who designed it, Baron Haussmann, who was the Prefect of the Seine Department under Napoléon III. Haussman’s intent in building this boulevard was part of his grand vision for the renovation and modernization of the city of Paris. Au Printemps was the first department store to be built on this nineteenth-century boulevard. The store’s architecture was sumptuous, very palace-like, with statues and a gold leafed roof gracing its exterior. Before the creation of department stores in the nineteenth century people had their clothes made to order, in small tailor shops that often did not cater to, and indeed seldom welcomed, the lower classes. Department stores “democratized” accessibility to personal attire, allowing anyone, regardless of class, accent, or social and regional background to shop without being identified with one group or another, and more importantly without being belittled or stigmatized. Also, the concept of a “price tag,” popularized in Parisian department stores, allowed people to shop around and “price check” items they may be interested in purchasing, without suffering the burden of having to deal with often onerous professional tailors. This marked the beginning of consumerism, mass manufacturing, the diminishment of small shops, and the creation and rise of a working/middle class. Additionally, Paris’s Les Grand Boulevard, of which Boulevard Haussmann was an important example, allowed people to see more of what’s around them and gave them the possibility to go out and be seen. This then created the urban notion of “being aware” and possibly “copying” and “duplicating” the practices of “others,” and the ways in which people dressed, walked, talked and acted within the public sphere. By then, buildings were being erected at greater heights, often at equal, even heights, giving the boulevards a pleasing eyeline. Looking closely at the architecture of apartment blocks and homes lining the boulevard reveals sections with clearly intended for distinct social classes. The ground floor apartments were ordinarily left for the very poor due to the fact that their locations, closer to the streets, made them noisier, and arguably less courtly. The floors above street level, that is to say the first floor, was generally reserved for the rich, as often could be seen from their larger windows (perhaps intended to reveal sumptuous interiors.) Likewise, as we progressively move up the floors, the windows generally got smaller, with the very top floor, the attic, where the servants lived, displaying the smallest windows. Our class went inside to visit the Printemps department store, in order to see not only the establishment itself but also its beautiful architecture with its colorful stained glass window ceiling. Connected to the Printemps, by way of a bridge is another iconic Parisian department store, the Galleries Lafayette, also by its own stained-glass window dome ceiling. Around the dome are the coat of arms of all of France’s provinces, perhaps suggesting to the visitors that all people, from all regions and all walks of life were welcome. We later went out to the terrace, to take in a beautiful view of Paris, savored from a different perspective. We then went to the Quartier BNF, an up and coming area which once held the working class, but was transformed into a more intellectual center. Book-shaped buildings can be seen holding books and scripts, giving way to the Passerelle Simone de Beauvoir, a pedestrian bridge over the Seine, built in the form of a wave. Although aesthetically pleasing, these “newer” architectural styles have proven to be somewhat inconvenient and less than functional. 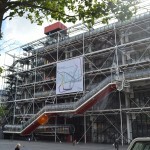 After our little walk to la BNF we went to visit La Cinémathèque Française, a building designed by Frank Gehry, and which was originally intended for the American cultural center which was later moved to a different more practical location. La Cinémathèque itself was created by Henri Langlois with the intention of preserving any and all films and props that he was able to get his hands on. La Cinémathèque is of great importance for the preservation of art, history, culture and knowledge which would have otherwise been lost in times past. Cinéma as an art form has been of great importance in French culture. We entered the dimmed room of the museum which had spotlights on objects and small films being projected on the walls. In this exhibit we were able to view the evolution of film cameras, moving-pictures technologies, props, costumes, and tools used for cinema throughout its history. The exhibit revealed that through history humans appeared to have always had an interest in moving pictures, as a way of preserving and perpetuating the present. 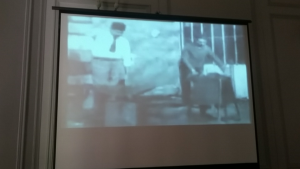 We learned that some “early” moving pictures were achieved through optical illusions; others were shadow shows used in places such as Rome and China; others still were puppet shows, the unrolling of painted paper rolls (as used in India,) or a spinning cylinder with slits along the exterior to view a picture or an object “move” inside. Other moving-pictures techniques included “stop action photography” used by Muybridge. Over time, these early forms of “moving-pictures,” or or optical illusions, eventually led to the invention of film. Films started out black and white, and silent. Some early films were painstakingly colorized by painting every slide by hand. Later the gramophone was invented which allowed to add sound to film. In 1895, the famous Frères Lumière brothers invented the first film camera to capture moving images. With this, their new technology, they planned to capture the movement of life in its social and political interations, providing an informative and documentary-like record. In 1895 the Lumière brothers produced a very short film called “L’arrivée d’un train” (A Train Arrival,) with the first showing scaring people out of the projection room due to their thought that a real train was actually coming toward them. Film became a sensation; an incredible concept. Anyone was now able to watch moving images and understand their content, even if they were illiterate. Likewise, film was able to capture the Industrial Revolution and various ways of life of various people around the globe. Around the same time the Lumière brothers were making their mark, in 1896, Georges Mélièrs chose to use film for entertainment, circus, comedic, theatrical, creative, fiction, and artistic purposes; in sum, two very different purposes of film which still define the medium to this day. During this visit, were able to watch snippets of films projected on the walls with some items used during the film displayed below. Among the films we were able to see were “Metropolis” with the real metal robot suit from the film, “L’Étoile de Mer” a surrealist picture, and Charlie Chaplin’s “Modern Times,” a film which can still make us laugh to this day, featuring a story about the fast pace of technology, which humans are ill disposed to keep up with, and which may ultimately crush them; a theme that eerily still rings true in our time. Overall, today was a gratifying illuminating culmination of a likewise interesting and fulfilling week. Today was another great day for us in France, and hope everyone back home is doing well. 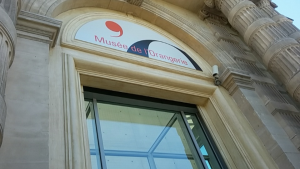 Today I want to share with you the amazing experience we had to visit the “Musee de L’orangerie”. 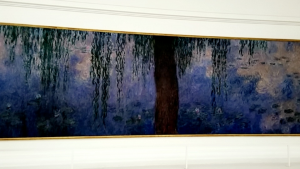 This museum reflects paintings of great Impressionist and Post-Impressionist paintings located in the Tuileries Garden such as one you may most likely know : “Pablo Picasso”, “Claude Monet”. Finally ending the day with a cinema seminar with “les freres Lumieres 1895”, and the movie “Paris Je T’aime” which I think was a really great, and interesting movie revolving around the theme of Love for others, and Love for Paris with this fulfilling idea of Hope. What was most intereting to me about it was how people living in a community can be so interconnected with each other. I would really recommend this movie. Finally ending the day with a very interesting documentary “The Gleaners and I” followed by great discussion about the different social norms, and how society may perceive the world within the France community but could also argue the same about other places in the world. It’s our 5th day is France and we’ve been having a blast! 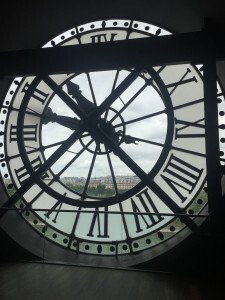 Today, we went to the Musée D’Orsay. The museum was originally a train station, but now it is used for the exhibition of famous artwork. This clock is part of the old architecture of the building. From it, there is a panoramic view of the city. This clock is also part of the old architecture. The art there is incredible. 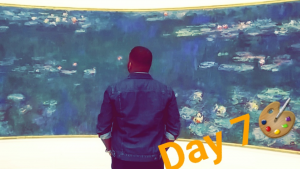 I really enjoyed the artwork by Édouard Manet because of all the history behind his paintings. It was the controversy during that time period that helped inspire his artwork. His painting style depicted what was happening in the moment and was very two-dimensional. 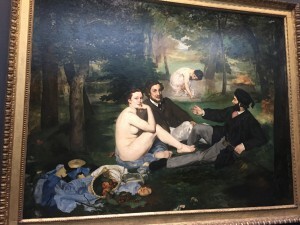 This painting by Manet is called Le déjeuner sur l’herbe. 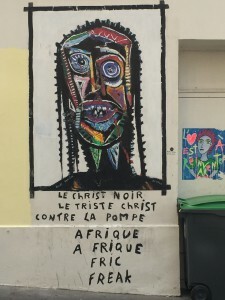 Many of his paintings were rejected, however this one was exhibited in the Salon des Refusés (Salon of the Rejected). One of Manet’s other famous painting Olympia, was unfortunately in Moscow… Why? No idea. By the time it gets back most of us will be gone, but we were able to see a small painting of the painting in another piece of artwork. 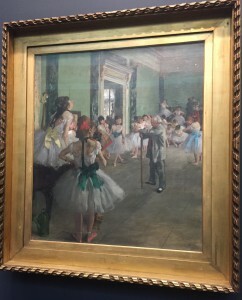 This painting by Edgar Degas is called La Classe de Danse. This was another painting I enjoyed because of the history behind it: the life of young girls who move to Paris and what they endure. 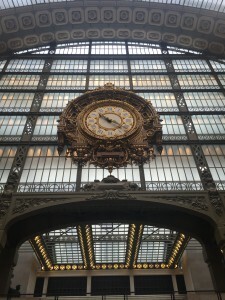 Musée D’Orsay is an incredible place enriched with history in not only it’s artwork, but it’s architecture as well. 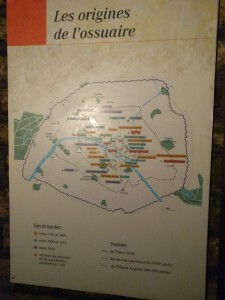 Paris is full of exciting history!